If you like crunchy, hearty, veggie packed salads that are full of flavor, then stop right here, because this salad is for you. 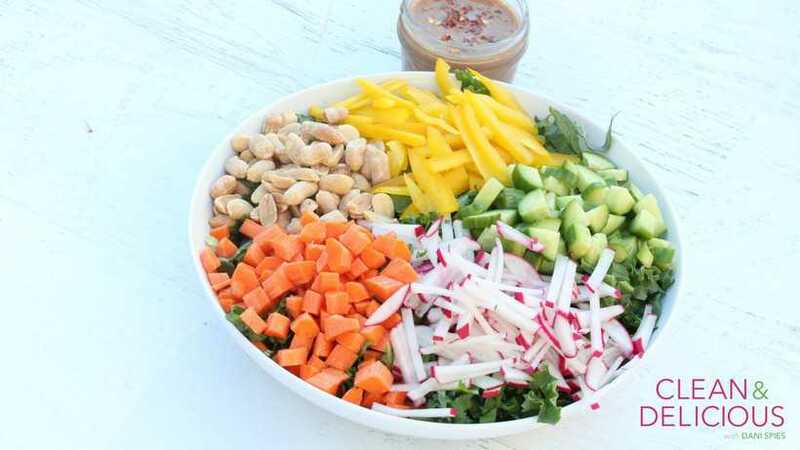 Kale + carrots + cucumbers + radishes + peppers + peanuts = salad awesomeness. This salad makes a delicious lunch or dinner and is also hearty enough to make on the weekend as a head-start ingredient (just be sure to keep the dressing and peanuts on the side). If extra protein is your thing, shredded rotisserie chicken is a great match for this delicious salad. This salad is addictive. Be warned! Slice the kale into thin ribbons and then toss together with the remaining ingredients. Combine all of the ingredients in a small bowl or spouted glass cup. Whisk until well combined and then add the hot water, as needed, to thin the dressing out.